Ahenny. North Cross. East Face. Ahenny. North Cross. East Face. Base Detail. Close up. Ahenny. North Cross. North Side. Detail of Base. Ahenny. North Cross. South Side. Detail Base. Ahenny. North Cross. West Face. Ahenny. North Cross. West Face. Base Detail. Arboe: East face of Cross. Detail of Shaft. Arboe. "Old Cross of Ardboe". Arboe. "Old Cross of Ardboe". Detail Cross Shaft. West Face. Armagh. Composite Cross. North Side. Lower fragment. N3 Panel details. Saints Paul and Anthony break bread in the desert. Base of Cross shaft, south view. at the west end of the nave inside the Church. Stone type: medium-grained massive sandstone. South view of the base of the Cross shaft, dated to the last half of the eighth century, first quarter of ninth century. Only half of the base survives, which gives us one figure. He is holding up his left hand with the first two fingers extended in blessing. He is thought to be an Apostle. 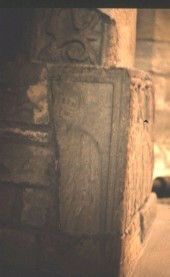 Above him is part of the bottom of the shaft with vine-scroll. Cramp, Rosemary, County Durham and Northumberland. Corpus of Anglo-Saxon Stone Sculpture Series 1st, Oxford University Press, Oxford (1984) Anglo-Saxon, Sculpture, Stone Carving..